2017 marks the 20th anniversary of BLACKMORE’S NIGHT - the internationally-heralded renaissance rock band helmed by six-string extraordinaire Ritchie Blackmore and vocalist/multi-instrumentalist Candice Night. To celebrate, the band is proud to present To The Moon And Back: 20 Years And Beyond…, a two-disc collection of favorites and new material. “We hope you enjoy this musical journey down memory lane from Shadow Of The Moon our first release… through our brand new 2017 versions of old favorites and a new surprise song. 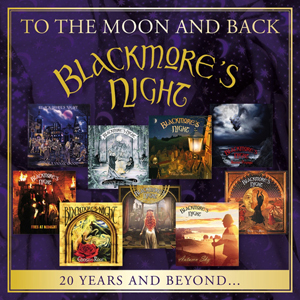 20 years of memorable music and beyond…,” enthuses Blackmore and Night. After 20 amazing years, BLACKMORE’S NIGHT continue to invite fans and newcomers to join them To The Moon And Back... Won’t you heed their call?